Today on homify 360°, we take a tour through a big and stylish family house which makes it look so easy to combine the modern style with traditional designs. Its secret? 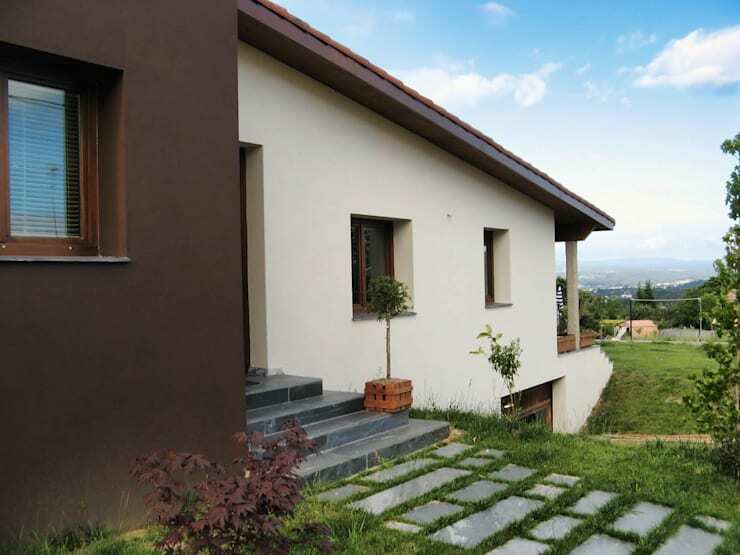 A variety of colours and textures (along with a hint of rusticity) ensures that the living experience is unique here, both on a visual- and functional level. 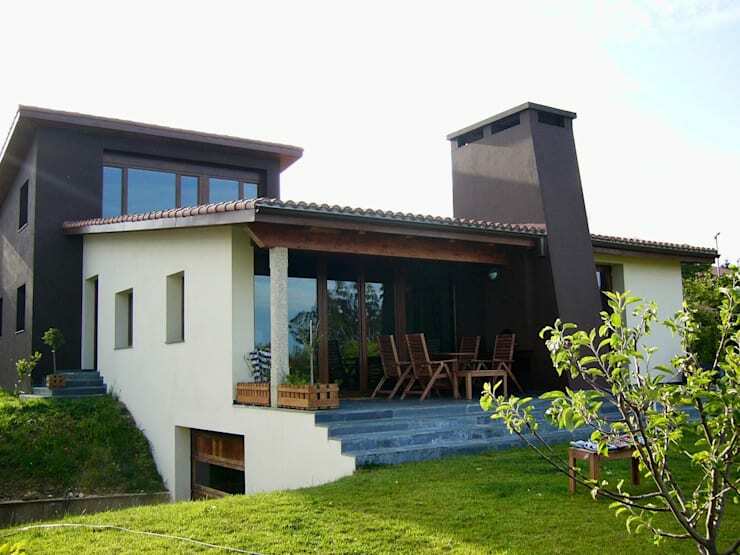 Conjured up by the professionals of Intra Arquitectos, both the exteriors and interiors of this house are creative, functional and very cosy. The key to this house’s successful look is also due to its choice of materials, which includes the likes of wood, stone, and glass bricks. So, ready for some stylish inspiration? A path created from concrete pavers lead us through the grassy lawn up to the neat grey steps of the front entrance. And don’t miss out on that fabulous landscape view in the background! Whether your dream property is located on a beach or in the middle of a dense forest, you can’t deny the beauty that goes hand in hand with a hillside overlooking the stretched-out valleys below. And that is exactly the location of this modern stunner – set on an uneven hilly slope, the design of the house cleverly accommodates the geographical challenges. The elegant terrace and lofty fireplace are also visible from here. It’s clear that the back side of the house opts for a more open and relaxed look, perfect for connecting the interiors with nature. 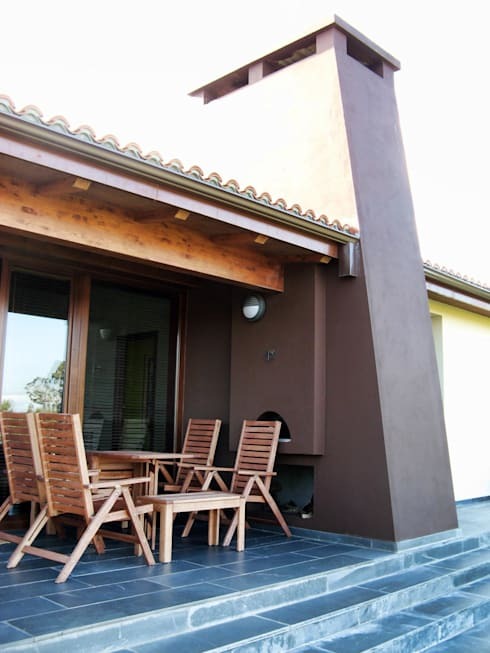 Imagine having a comfy sit-down on that terrace and overlooking the vast landscape while enjoying good company. 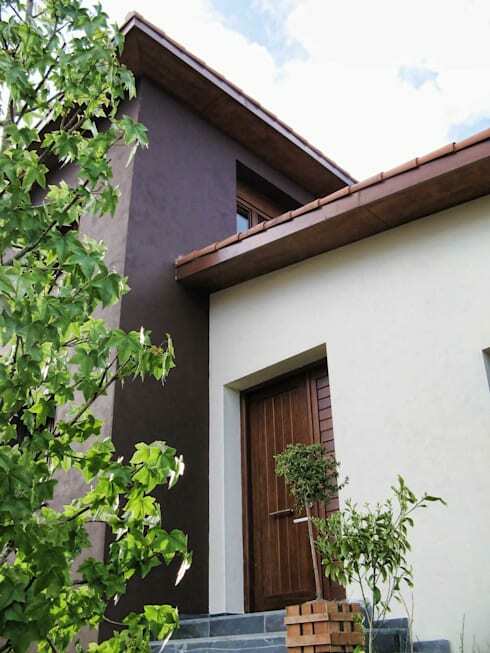 We just love the earthy colour palette of the façade and how it combines contrasting shades of brown, grey and white for a cosy yet motivating look. In terms of materials, wood, stone tiles and concrete join hands to lend personality to the structure, while ensuring a subtly traditional air. Aside from linking up the interiors with the refreshing back yard (and landscape), the terrace is also perfect for enjoying the weather year round. Because it’s shaded, it offers decent protection from both sun and rain. And you know what that slick fireplace means… a warm and cosy spot during the winter months! The best of raw materials (wood and stone) combine to make the entryway a warm and relaxing area. 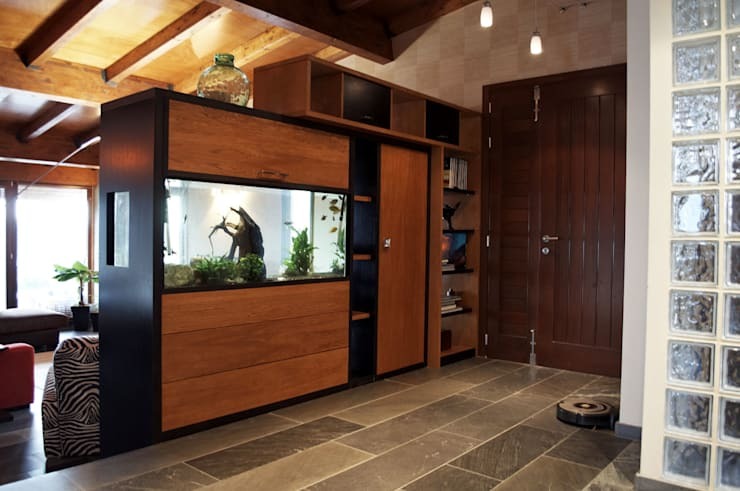 For functionality, a customised and modern storage unit has been built on the left, even accommodating a large aquarium as well. A clever contrast of red and green gets splashed across the accent walls in the dining room, lending an air of sophisticated charm to the space. 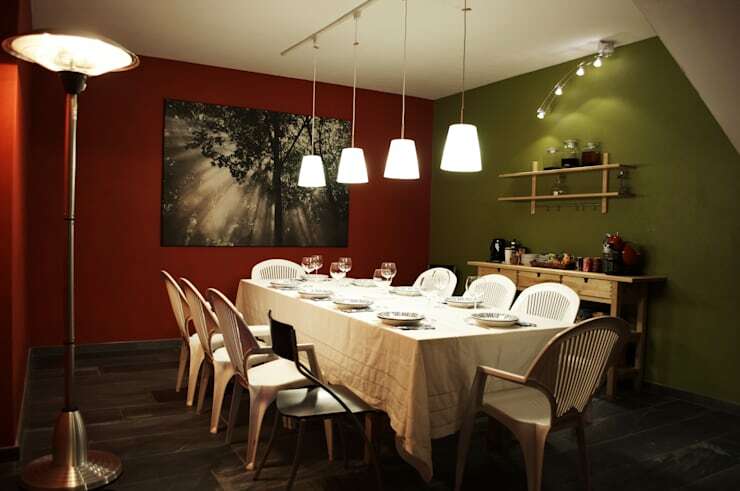 Contemporary pendants dangle from the ceiling, beautifully illuminating the crisp-white dining table and –chairs. 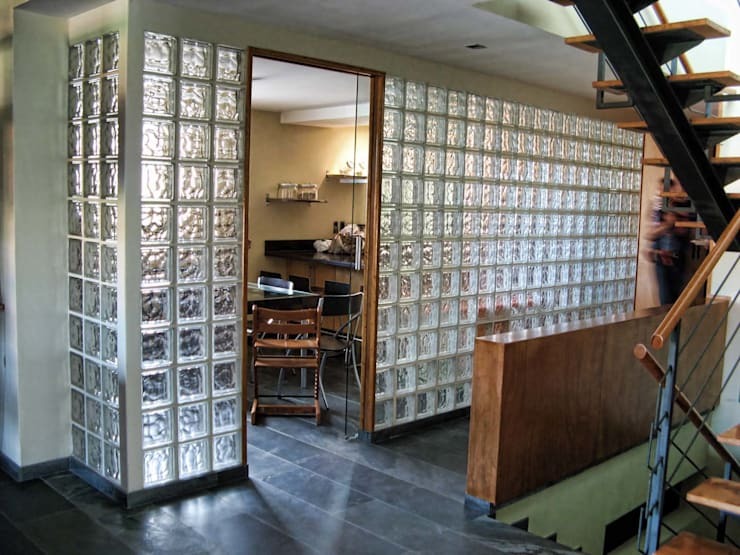 A semi-transparent wall with glass bricks is used to partition off some areas for a sense of privacy. However, this still allows enough natural light to filter through, ensuring a feeling of brightness and openness. 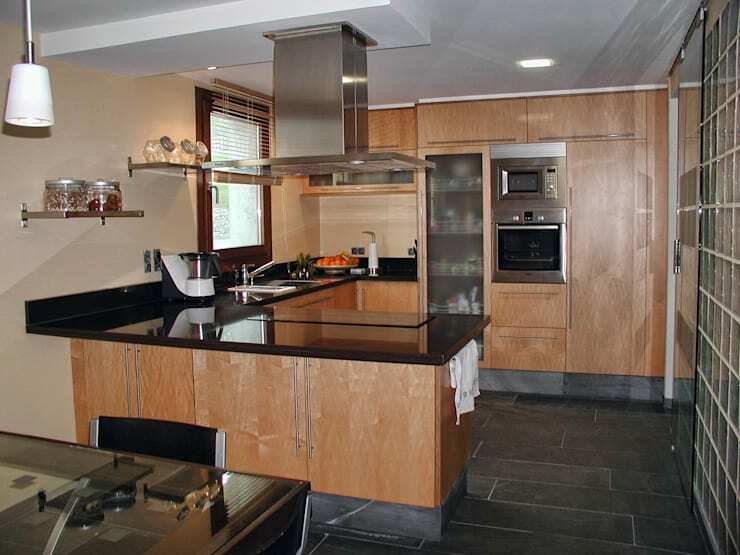 Warm wooden cabinets, white walls and grey stone flooring make this kitchen a cosy and pleasing space. Glossy black countertops and shiny steel appliances add the required amount of modern style, while a large window brings in decent sunlight. Check out our range of kitchen planners to help you conjure up the culinary space of your dreams. Continuing the success of using raw materials, a polished wooden floor and less-glossy timber beams neatly frame the master bedroom. And doesn’t that large, plush bed with white linen just look so inviting after a long and tiring day? 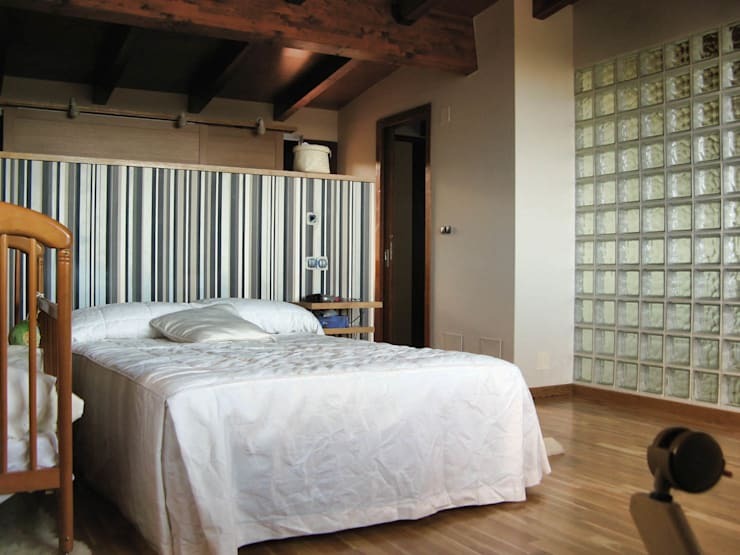 We especially love the striped headboard (a very unique and clever touch), while a wall of glass bricks on the right ensures that the bedroom stays well-lit and semi-open to the rest of the house. Speaking of headboards, scope out these 22 beautiful headboards for your bedroom. 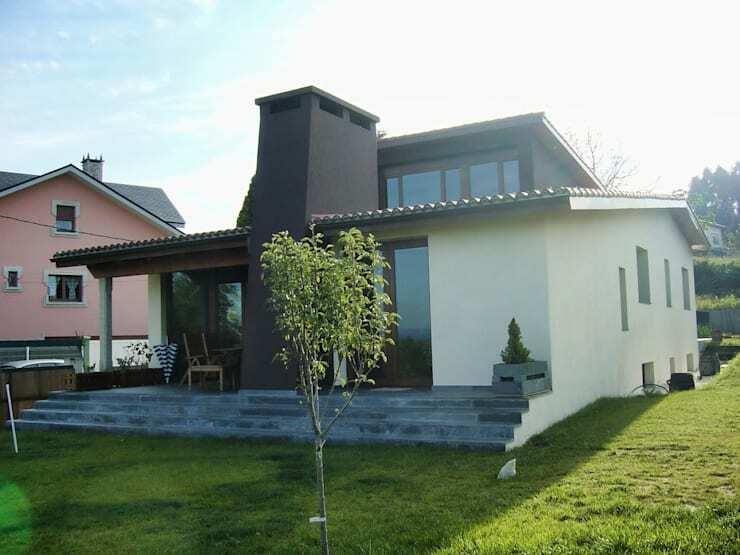 We’re curious what you think of this house, so share your thoughts in our comments section below.